Everything About This Magnificent Food Creation Is Unbelievably Delicious. I Want It Now. Finally, pizza and cake are together as one! Specifically, as one monstrosity of a meal called, get this, pizza cake that I’d like to eat for breakfast, lunch, and dinner until my heart explodes or the world runs out of it. As much as the thought of a world without pizza cake may scare us right now, I’m sure the Internet will have created a new mouthwatering mutant food by then. Maybe something like pizza pie. Wait, that’s just pizza. 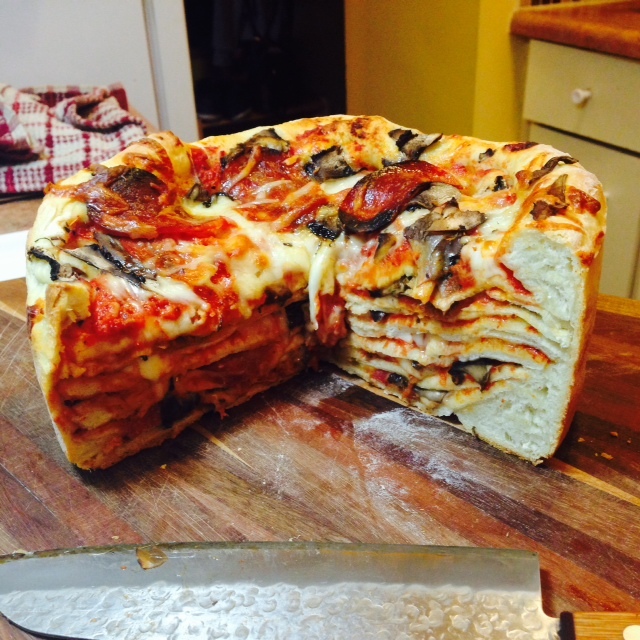 Okay, I’ll leave that up to the experts–people like chilza, who made this pizza cake for their boyfriend’s birthday. You’ve really got to see it. Apparently, it tastes as good as it looks too. I think it’s safe to say that it was a happy birthday. According to chilza, making the dough layers was a bit time consuming, but the building and baking weren’t that difficult. In total, it took about an hour and a half. Which roughly breaks down to an hour of prep and half an hour of baking. Please DO try this at home! Share this post and get people thinking about making a pizza cake for your birthday.